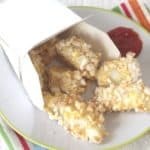 Healthy homemade fish fingers, coated in rice cakes, that the kids will love getting involved in making. Preheat the oven to 180c and line a baking sheet with parchment. Cut the fish into bite sized pieces. Set up an assembly line of three plates; one with the flour, one with the beaten egg and one with the crushed rice cakes. Taking one piece of fish at a time, coat it in flour, dip it in the egg and roll in the crushed rice cakes. Place it on the baking sheet and repeat for each fish finger.